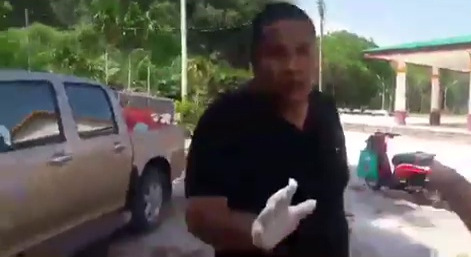 PHUKET: Soi Dog Foundation (SDF) today called for a full investigation into the poisoning of dogs and puppies in front of children at a school and on temple grounds in Nakhon Sri Thammarat province, and called for an end to such atrocities. A video that exposed the killings has gone viral on Facebook, with more than a million views by today (Mar 21). SDF Director of Animal Welfare, Varaporn Jittanonta, was scheduled to meet with Department of Livestock Development (DLD) officials at their Bangkok headquarters today, to demand an end to such indiscriminate killings. Poisoning is a slow and cruelly painful death, and totally unnecessary, the SDF noted in its release today. "Figures indicate that there is no rabies epidemic in Thailand. But there appears to be a deliberate campaign by some people to whip up a mass killing of the estimated 8 million stray dogs across the country," the SDF explained. "The SDF urges the DLD to confirm that no more dogs will be randomly killed. Dogs in areas where rabies is believed to exist should be vaccinated, sterilised and placed in quarantine." "Once cleared of having the disease they should then be returned, to build up the 'herd immunity' to the disease in their territory, not as happened with dogs from Pranburi last year. "In that case, the dogs were impounded permanently in the large dog shelter in Buriram. This allowed other dogs – that were not vaccinated – to replace them in Pranburi. "Removing vaccinated sterilised dogs – as appears to be happening now in Hua Hin – is insanity. It will actually encourage the spread of rabies as other, unvaccinated, dogs take over the area," the statement added. "The fact that vaccinated dogs are being removed only goes to fuel speculation that this has nothing to do with rabies control but is more to do with a general policy to stamp out stray dogs. "No dog should be euthanised unless tests show that it is infected. Any dog found to have rabies should be humanely euthanised. Poisoning is not humane," the SDF said.